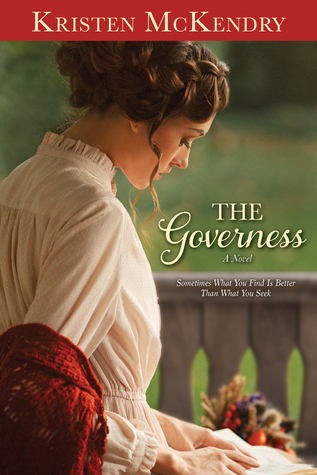 The Governess by Kristen McKendry. Publication: October 10th 2016 by Covenant Communications. Independent young Kate Porter envisions a future far greater than the middle-class existence she’s always lived, and her work as a governess is simply a means to an end. The glittering world of a society wife calls, and her new position as a private tutor for the children of Mr. Alonzo Colaco is a step in the right direction. She merrily imagines the grand house awaiting her—but when her new employer meets her at the train station driving a gaily-painted gypsy wagon, Kate suspects her new job as a children’s tutor will not be all she dreamed. Instead of the mansion she anticipated, Kate finds herself living in the woods in a refitted train car and teaching the charming children of Alonzo, a tinker by trade. After trying in vain to secure another job, Kate is left with little choice. She must simply bide her time until a better position presents itself. Before long, however, she finds herself abandoning her petticoats and preconceptions in favor of the joys of a simple life—and the possibility of true love. But when opportunity knocks, will Kate really be ready to walk away from all she’s come to care for to pursue her high society dreams? I loved loved loved the idea behind the book! Every girl wants their happily ever after that includes a husband and a big house and the idea of a fairy tale and living in high society! Kate (Katherine) is no exception. So while she clings to it, she finds that she may be a little shallow. She has to decide if she is willing to pass up love for the idea of a fairy tale. The cover says "Sometimes what you find is better than what you seek". I love that! Kate's parents died and with little family left she finds herself with her cousin who has been taking care of her. They remind her that she is living off of their kindness while she is penniless. She was an educated woman, her parents saw to that. Taking up some dignity, Kate leaves them to find a career to take care of herself. What she finds is Alonzo. He is a kind man who needs someone to teach his children. She accepts it thinking she is going to a big home and servants, etc. But in reality, she finds that he lives in a train car in the woods and he drives a gypsy type cart. When she realizes the condition she is to live in, which includes finding a bush in the woods to take care of business, she says she will stay long enough to find another job. Little by little, her heart grows fond of his two well behaved and kind children and their father doesn't live by society's rules. When an opportunity comes to take another job, she jumps because Alonzo kissed her. Her heart wants Alonzo but here is where Kate is a little shallow. She wants the opportunity for the fairy tale instead of the love that Alonzo and his children give her. Kate has to realize that the fairy tale is in the happiness that comes in the woods with the children and the man that truly loves her. I wanted to slap her silly. She broke their heart when she left. I love this reverse fairy tale. The idea that the happiness isn't in the big house or the high society or even having a proper bathroom is a great message. It made me realize that maybe I might be a little shallow myself and the books I read are mostly filled with that fairytale that comes with getting everything you want instead of what we all really need which is pure love. I kind of guessed the ending but didn't realize it until right before it happened. I so so so loved that ending! I would recommend this book to everyone! It has a great message, it's romantic,funny at times, and a real eye opener for me!